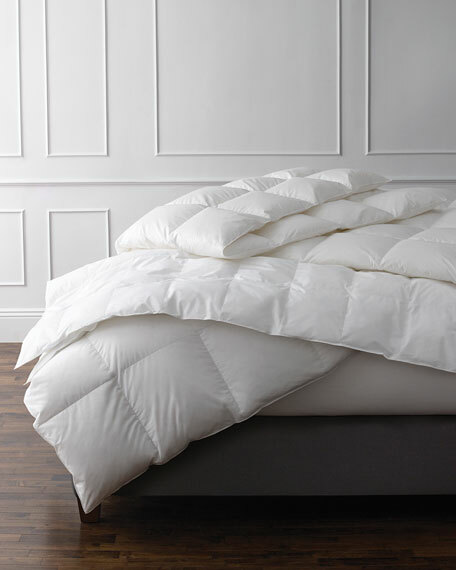 European goose down comforter with cotton sateen shell. Down comforter of 320-thread-count European white cotton batiste. White goose down fill; 850 fill power. Baffle box design for maximum loft. Exterior double edge stitching with piping. 81" x 86". Arrives in protective fabric storage bag. Handcrafted in the USA. Down comforter of 320-thread-count European white cotton batiste. Luxe sizing; 116" x 102". White goose down fill; 850 fill power. 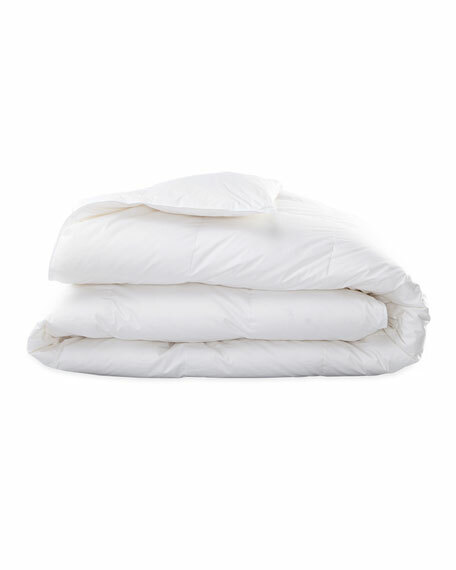 Down comforter of 320-thread-count European white cotton batiste. Luxe sizing; 116" x 102". White goose down fill; 850 fill power. Baffle box design for maximum loft. Exterior double edge stitching with piping. Arrives in protective fabric storage bag. Handcrafted in the USA.